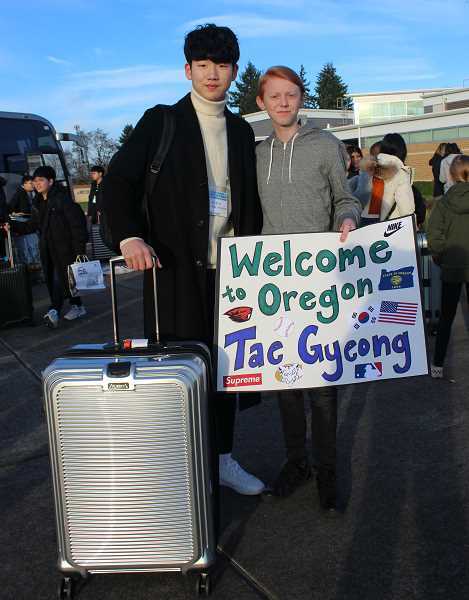 Baker Prairie Middle School staff, students and families once again welcomed guests from South Korea for a week's stay beginning on Tuesday, Jan. 15. The guests—students, their English teacher and their principal—come from Annam Middle School, which is in the coastal city of Changwon, South Korea. Annam is one of two Baker Prairie sister schools. The other is Gangbuk Middle School in Daegu, South Korea. Each year, as part of Baker Prairie's Korean Studies program, Gangbuk students visit in the fall, Annam students visit in the winter and Baker Prairie students travel to both Korean cities in the spring. On Tuesday afternoon, Baker Prairie host families scrambled to the school with their welcome signs as the South Koreans' charter bus had arrived early from Seattle. The next morning, Baker Prairie held a welcoming ceremony for the guests featuring speakers and performers from both Annam and Baker Prairie. "Every year, when Annam Middle School students visit Baker Prairie and again when Baker Prairie students visit Annam Middle School, two worlds collide," said Baker Prairie Math Teacher Amanda Graber at the assembly. "Use this collision of our two worlds to make a better one on the other side," Graber continued. "Learn from each other. Stretch each other. Grow with each other. Find some common ground and learn from your differences, and never forget that the friendships formed this week can last a lifetime." Annam student Ji-hu Lee also spoke, touching on cultural differences, new relationships and her gratitude. "We are so excited to be here, experience your culture and build long-lasting relationships," Lee said. "I hope we have a good time by doing various activities and visiting many places. I can't wait to tour American places and do many things with my host family." Annam students had the chance to sight-see not only with their host families, but also through school-sponsored field trips to the Oregon Zoo, OMSI, the Nike outlet store, the state capitol where they met Governor Kate Brown and more on Thursday and Friday. 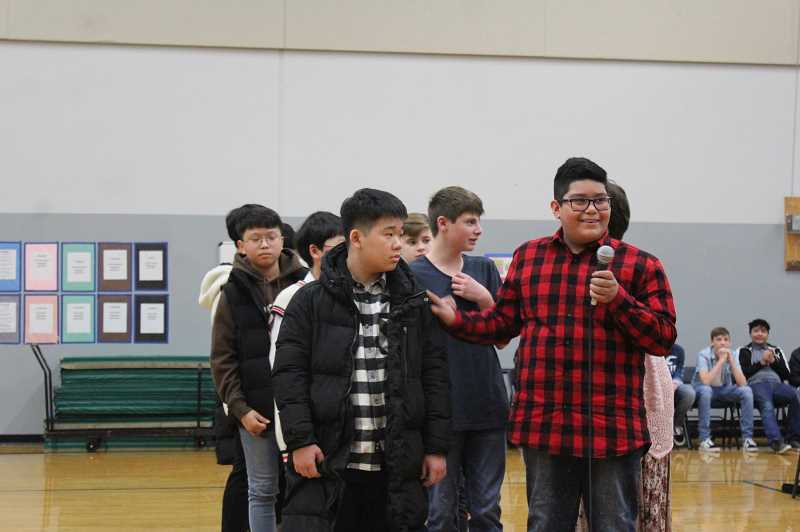 These opportunities provide more than good times for both Annam and Baker Prairie students, Annam Principal Won-hyo Jeong expressed at the assembly. "We have fostered a sense of community and global citizenship through relationship and cooperation," Jeong said through interpreter Ms. Jeong, Annam's visiting English teacher. "I'm sure those students from both schools will have a wider view of the world and open their minds toward other people through our meaningful and critical, mutual visits. These cultural experiences will take you to a wider world and a big picture." With the Annam sister-school relationship in its eleventh year, many Canby families have hosted and many Canby students have visited South Korea. They all express similar sentiments: they still keep in touch with their Korean guests and hosts. Baker Prairie student Skyler Milano shared that between her and her older sister, her family has hosted twice now—one student from Annam and one from Gangbuk. "Hosting is an amazing opportunity that our schools give us," Milano said. "You both make lifelong friends and even a whole new family."